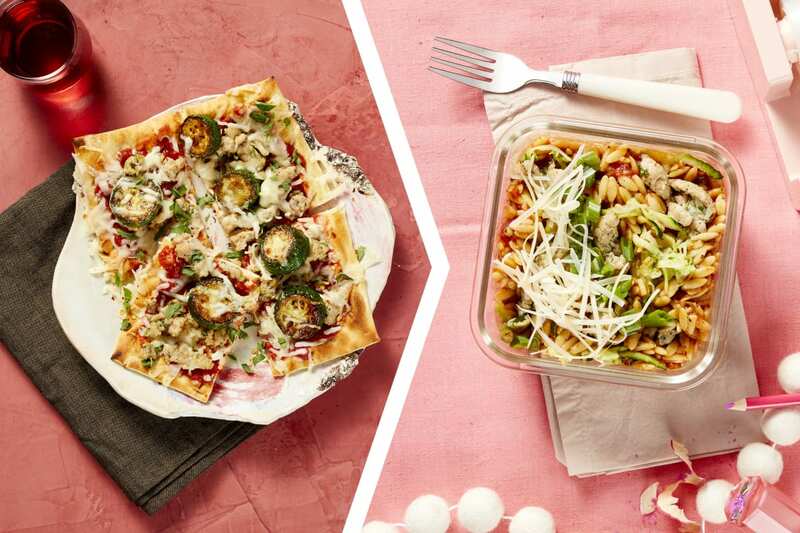 Cook it once, eat it twice: tonight’s dinner extras transform into tomorrow’s lunch. 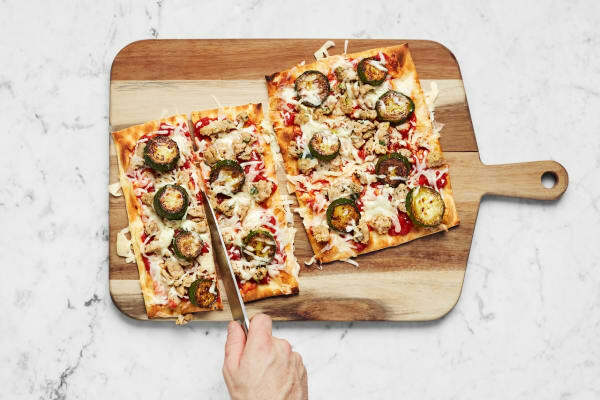 For dinner, enjoy crisp flatbreads topped with Italian-seasoned tomato sauce, chicken sausage, broiled zucchini coins, gooey mozzarella, and chili flakes. 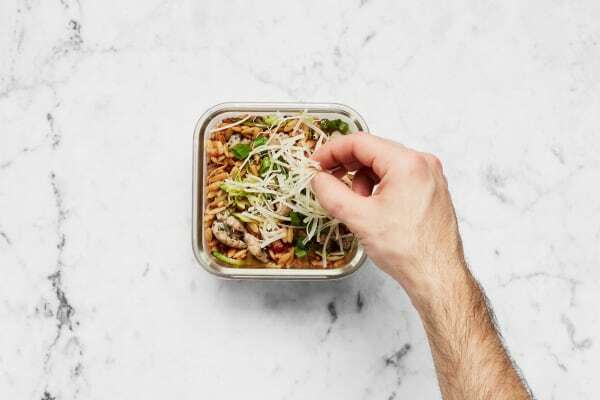 The next day, enjoy a hearty pasta bowl with the extras—grated zucchini, sausage, tomato sauce, and Parmesan. 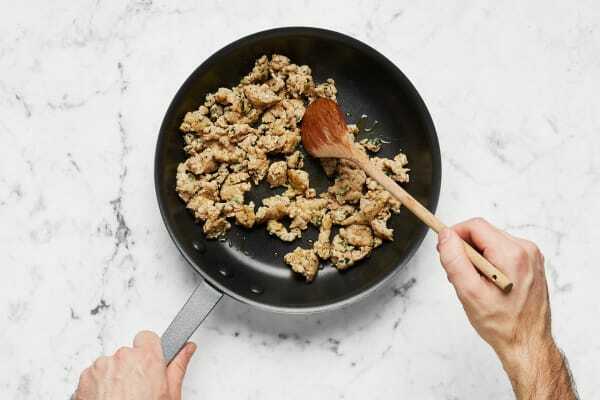 The Lunch Italian Orzotto nutrition information is as follows: Calories: 840, Fat: 37 g, Saturated Fat: 17 g, Carbohydrate: 84 g, Sugar: 11 g, Fiber: 6 g, Protein: 42 g, Cholesterol: 180 mg, Sodium: 2000 mg. The nutrition facts panel below represents the nutrient values for the Chicken Sausage Flatbread Dinner. Preheat broiler to high (or preheat oven to 500 degrees). Wash and dry all produce. Cut one zucchini into ½-inch-thick rounds. 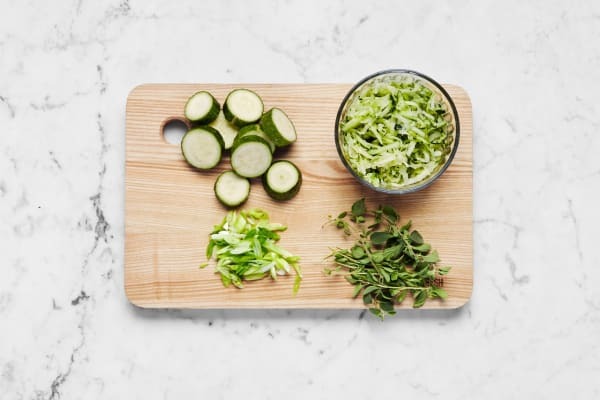 Trim ends from remaining zucchini, then grate into a medium bowl using the large holes on a box grater. Trim, then thinly slice scallions, separating whites from greens. Pick oregano leaves from stems; discard stems and roughly chop leaves. 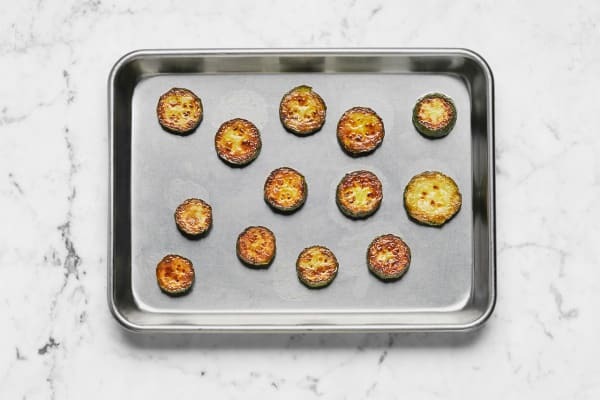 Place zucchini rounds on a baking sheet. Toss with a large drizzle of oil. Season with salt, pepper, and 1 tsp Italian seasoning (we’ll use more later). Broil until browned and softened, 5-7 minutes. (TIP: Watch the zucchini carefully, as it may brown quickly.) Transfer zucchini to a small bowl. Reserve baking sheet for flatbreads. Adjust oven temperature to 450 degrees. Heat a large drizzle of olive oil in a large pan over medium heat (use a nonstick pan if you have one). Add sausage, half the oregano, and 2 tsp Italian seasoning. Cook, breaking meat up into pieces, until browned and cooked through, 4-6 minutes. Remove from heat; transfer sausage to a large bowl. Melt 1 TBSP butter in same pan over medium-high heat. Add orzo and scallion whites; toss to coat. Cook, stirring often, until toasted, 2-3 minutes. Stir in stock concentrate, half the tomatoes, 1¾ cups water, and 2 tsp Italian seasoning. Bring to a boil and cook, stirring occasionally, until liquid has evaporated slightly, 5-6 minutes. Stir grated zucchini into pan. 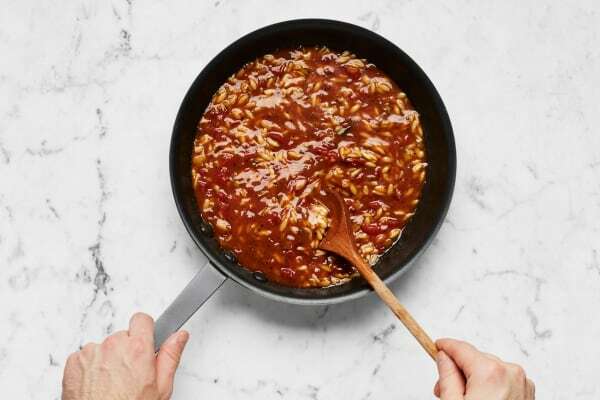 Cook until zucchini is tender and orzo is al dente, 3-4 minutes. Stir in half the sausage and 1 TBSP butter. Divide between containers. Sprinkle with scallion greens and Parmesan. Keep refrigerated until ready to eat. Enjoy at room temperature or microwaved to reheat. Place flatbreads on baking sheet used for zucchini. Evenly spread with remaining tomatoes; season with salt, pepper, and remaining Italian seasoning. Top with mozzarella, broiled zucchini, and remaining sausage. Bake in oven until flatbreads are golden brown and cheese has melted, 4-6 minutes. Remove from oven and let rest 1-2 minutes. Scatter with chili flakes (to taste) and remaining oregano. Cut into slices, then serve.